Sherman's Kit for sale. Buy online at Zingerman's Mail Order. Gourmet Gifts. Food Gifts. The deli sandwich of their dreams. The perfect lunch—by mail. If you know someone who loves real deli fare, sending this gift will cement your status as the most clever, generous friend they have. Some assembly is required, but considering it has been known to make grown men weep in appreciation, we think it’s worth it. Included: Jewish Rye (Pumpernickel in Brooklyn Reuben), sliced deli meat (Corned Beef, or Pastrami, or Turkey), freshly sliced Emmentaler Swiss cheese, Zingerman’s potato chips, Coleslaw, Sauerkraut, Russian dressing, garlicky pickles, Magic Brownie Bites. Download our professional-grade instructions, which also come inside the box. 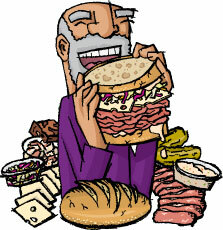 Or watch this tutorial on how to make a Zingerman's reuben! How to make a Reuben by Zingerman's Community on Vimeo.